Public speaking doesn’t come easily to everyone, but for most of us, it’s an essential skill to get comfortable with. FoL’s Speaker Showcase offers participants an opportunity to hone their public speaking skills, make new connections and build profile, all in a mutually supportive environment. 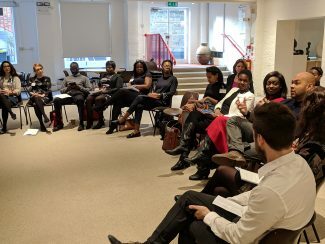 The Showcase was created as part of FoL’s Speaker Diversity Network to support the Speaker Bank, a database of people (now around 150) which Future of London maintains to promote under-represented voices in the built-environment sector. When FoL gets a request or is notified 0f all-white-male panels, we offer (at no charge) expert speakers from different backgrounds to help diversify events. The Showcase has since taken on a life of its own as a popular training and networking option, and while priority for spaces still go to people from under-represented groups, all are welcome. Whether you have three weeks or three minutes to prepare, make sure you know what you’re saying, in how much time, and with what AV. Run it through: in the mirror, in an empty room, to your partner, colleagues, friends, children or pets! Think about who the audience will be. What will the space look like? Close your eyes, think about it, run it through – the aim is to feel like you’ve already done it! 2. Keep it simple – think about take-home messages and aim for a ‘plain English’ approach. 3. Be “light-footed” with your audience – particularly with longer presentations, it’s important to read the signals – if someone is nodding off, engage them; if you’re rambling, wrap it up. Speaker Showcases are always lively and November’s cohort pushed the bar. Participants delivered an eclectic mix of talks, but all blended personal interests with professional concern. Kazadi Mwamba, Business Growth and Investment Officer at LB Waltham Forest, spoke about the role of patience in attaining goals; Cordelia Osewa-Ediae, Senior Consultant at Green Park, brought out the human side of her experiences in working to advance the diversity agenda (see below); and Michelle Seale, Head of CSR at Axis Europe Plc, reflected on unhelpful stereotypes and routes into the sector, urging delegates share experiences and ‘pass it on’. Registration is now open for February’s Speaker Showcase, sessions are free to attend and open to all. To find out more about these free events or to discuss potential topics, get in touch with Oli, who will be more than happy to help. What is your role? I’m Senior Consultant at Green Park and a Clore Social Fellow. Green Park is an executive search firm that champions diversity because we are on a mission to change the way the world sees talent. My role involves supporting a wide range of clients, from all sectors, so that their organisations and leaders are in a better position to attract, retain and support diverse talent. In which scenarios do you find yourself giving presentations at work? At work, I regularly deliver presentations to clients and partner organisations. We are constantly exploring how employers can become more inclusive, so these presentations have to be tailored every time to ensure the audience is engaged effectively. As a Clore Social Fellow, I also deliver presentations about social mobility and employability to policy makers and leaders. Why did you decide to join a Future of London Speaker Showcase? 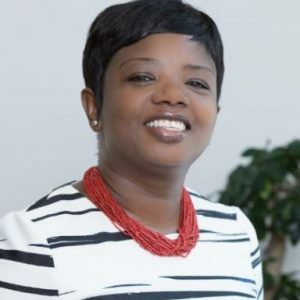 I attended a Future of London networking event and I was impressed by the wide range of speakers. It was quite refreshing to hear new voices. When I was then asked whether I was interested in joining the Speaker Showcase, I accepted without hesitation because I felt it was a great opportunity to contribute to any debate about how we can make London more inclusive and fairer to all. What topic did you choose to present with your three minutes/three slides, and why? I spoke about my work because I felt it was a good opportunity to give others some insight into what I do. A lot of my work involves difficult conversations that explore sensitive issues like inequality, misogyny and ignorance. While this can be challenging, I am particularly thrilled when someone who previously struggled to discuss these issues becomes comfortable enough to explore them in depth. I wanted to get the audience thinking about practical ways to tackle some of these issues and the feedback I received showed that they appreciated my candour. What did you gain from attending the event? The feedback from Bevan Jones, the mentor, was really useful. It was also wonderful to hear about the impressive work the other attendees were involved in. If you met someone who was considering taking part in the Speaker Showcase, what would you say to them to convince them? I would advise that they take part in the Speaker Showcase because there are very few opportunities in London where one can develop their speaking skills in an atmosphere where credible mentors and peers provide feedback and support. Come out from behind the lectern, keep open body language and try to ‘own’ your space. Cue cards are often better than a script or excessive notes – use words or phrases as prompts for key points. More and more speakers are using technology such as tablets or phones over paper notes – these are useful tools, but beware of pitfalls such as the device locking or notifications popping up. When presenting with tech, make sure it’s hidden from view or used subtly – looking down at a phone can leave the audience feeling more disconnected than if you scan notes, since the audience can feel that you’ve checked out. Statistics can add weight to ideas, but get a friend of colleague to check the detail – fresh eyes will pick up typos you may have missed in your talk or on your slides. Particularly if you’re presenting ‘dry’ topics, keep the tone light and have strong visuals. Make it personal – don’t be afraid to include family photos or set out your personal connection to the issue. Look at the audience, do not present to your slides! If you need a clicker/laser pointer, bring one or ask for one. If not, go ahead and refer to points on your slides, but come back to the audience. Have a backup or be ready if technology goes completely down – you know your material; don’t stop! To close, think about using a ‘call to action’, an instruction to the audience. It could just be “come to our event” or “spread the word”. Or you could try something more targeted, for example: “find one thing can you take from today and apply in your work tomorrow”. Registration is now open for February’s Speaker Showcase; sessions are free to attend and open to all. To find out more about these free events, to join the Speaker Bank or to support Future of London’s Speaker Diversity Network, contact Head of Networks Oli Pinch.